Musical Recommendations: Jonah: I recommend the book “Space is the Place: The Lives and Times of Sun Ra” a fascinating insight into his spiritual ideas and musical vision as well as a social commentary of the time. Gal: The song "Liquid Deep" by Dreamcast & Sasac has been really stuck in my mind (in a good way) the last couple of weeks since we saw the guys perform it live at a show in DC. Superb! Jordan: I started around age 13 on a Yamaha synth/drum combo type fm synth Since it was the mid 80s I was really into pop ... Pet Shop Boys, Duran Duran, New Order, Run DMC, Madonna etc etc. I guess I liked the idea that one person can make the whole song all the different parts, instruments etc ... And relatively speaking, with my little setup I could imitate a bunch of the music I was into. Later in my teens I added a 4 track and some fx cause I got into more industrial type sounds of the late 80s. Jonah: Started musical life as a drummer aged 13 and used to play along with my favorite records: David Bowie, various jazz, anything really. After discovering the existence and possibilities of electronics it was initially Kraftwerk , Cabaret Voltaire, New Order and stuff like that which got me excited, especially bands that integrated live instruments with machines. After realizing how hard it was to make that integration given the complexity and expense of such a set up I decided to go it alone for ease and simplicity. The techno/ ambient I started to hear in the late 80's gave me the vision for the viability of solo creative expression. The discovery of my own sound was a lot to do with which gear I could afford and make function properly in a rig - I ended up with a tr 808 , a sequential circuits pro one, and an Emu sampler plus cheap FX. That's what I found I needed to create a complete sound and is what I used for my first record. Gal: I think we have become more efficient over time, perhaps able to recognise what sounds right quicker, and acquired a better understanding of working the tools. But the challenge is always the same - creating a piece of music that will sound good now and in 10 or 20 years, that will work both in your living room and on a big club PA, that will be sonically and musically interesting even after listening to it many times. David: I started home recording in the 80s. Tascam 4 track cassette recorder, soundmaster rhythm machine, korg poly 61, several guitars, effects, drum kit fender rhodes. Still in the 80s, I started doing some commission work for a local cable tv and advertising studio. So I bought a dx-7 with qx-21 hardware sequencer, Prophet 2000 sampler. 8-track reel to reel tape. smpte synchronizer. Around 1990 I got introduced to techno and started hunting the usual line of suspects by Roland. tr-808-606-909, sh-101, juno 106, mks-50, jx-3p etc. I only ever sold a handful of instruments: like my fender rhodes which I just bought back from the same guy after 35 years … Also got rid of my Akai sampler and a few drum machines. Gal: I guess machines give you a ton of options, Humans need a vision to turn this into something musically appealing. The machine can create sounds that are not possible to create any other way, but the person is the one to program the sound, or for example make it sound more funky and alive in a song, depending on how you actually play. Machines are essential building blocks, naturally, when it comes to electronic dance music. The musician however can define its grid . Jordan: The Mulholland Free Clinic never visited a studio together. All of our recorded material is recorded live during our live shows. Direct from the mixer, no additional production. Only editing/shortening the stereo track to fit on vinyl. During our live shows, each one of us is dealing with a different array of production tools and instruments. Jonah is mainly playing his wonderful modular setup and sharing the drum machine responsibilities with Gal, who also plays guitar occasionally and handles fx. David recently has been playing a Korg Minilogue and a Roland jx3p, and sharing an sh101 with me, I also play on a Roland d50 and a Korg poly800. Since non of the music is pre prepared or pre sequenced we are all quite busy in our own separate tools/instruments during the show. Dunno if I answered the question. Gal: Collaboration is how this project came to life in the first place. 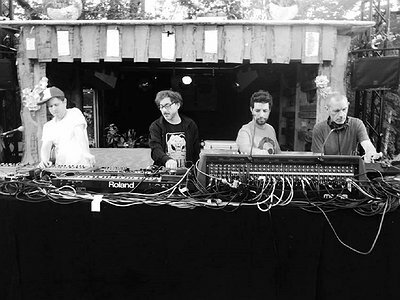 Reagenz, Magic Mountain High, Juju & Jordash - we are all different groups that share a very common idea of creating music on stage through group improvisation, starting from a blank canvas. We feed from each other’s idea to hopefully achieve a greater whole and to have some fun during the ride … This is perhaps different than ‘’just’’ jamming, where it often means several musicians improvising on an existing or common theme or structure. In an ideal musical improvisation situation no or very little talk is actually needed. Listening is key. Gal Aner: "In an ideal musical improvisation situation no or very little talk is actually needed. Listening is key."